Discover the benefits of the Cretan diet-gastronomy. V4vita is a family business which, following a tradition of lots of generations, was established by people with long experience in the production of pure Cretan products. Recently, there have been more and more studies that point out how eating a healthy, balanced diet is an important part of maintaining good health. Healthy eating and exercise are our most powerful weapons in our struggle for a better quality of life. Being the spearhead of the broader Mediterranean diet and through lots of studies and experiments, Cretan diet has proven to play a key role in issues relating to health and today’s demanding lifestyle. However, Cretan diet does not set strict rules, neither does it follow a specific protocol. It surely is not the result of a study, but the reason for research on how it succeeded in giving the people of Crete a life without health problems, during some quite difficult and troubled times. If one were to define what the Cretan diet really is, they should mention not only the foods included, or what ingredients were used or when the dishes began to combine, but also how the Cretan cuisine became the centre of attention, the key point that made the Cretan dietary archetype the subject of long-term studies by many researchers. Thus, we cannot simply talk about the quality of the food and how often the Cretans would consume it; we also have to take a close look to their way of life, which is part and parcel and goes hand in hand with this cuisine. Since antiquity and up to the 1980s, the dietary pattern of the Cretan diet was mainly based on the consumption of olive oil, wild greens, olives, high-fiber rusk, pulses, lots of vegetables and fruit, honey, dried fruit and seeds, wild herbs, grain, milk, etc. Of course, Cretans would also eat meat, but its use was relatively limited. But what was it that made this culinary tradition world-famous? Besides the actual eating habits of the islanders, what makes the Cretan diet unique is also the daily exercise, which has been traditionally connected with the agricultural and livestock-keeping activities of the Cretans, and their lack of stress! Simply put, this miraculous way of life of the island’s inhabitants, who had to make the most of the poor resources of their land, has been the recipe for their longevity, good health and high quality of life! So, if you are looking for the most tasteful way to live a long life with no health problems, all you have to do is follow the Cretan diet, not out of privation but by choice! 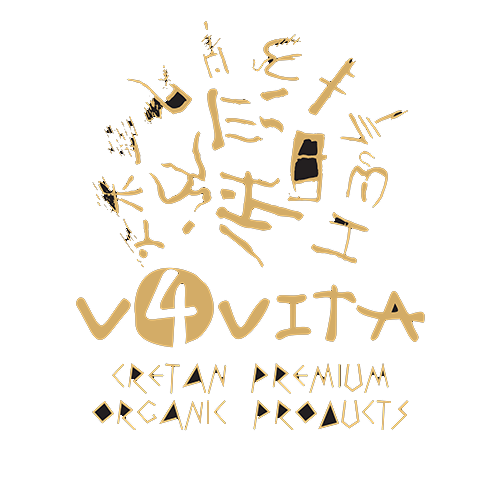 Interested in proper nutrition, with the utmost respect to the Cretan tradition and in accordance with all safety standards, we –the people of v4vita- offer the consumer 100% natural products without preservatives and additives. Our goal is to bring more and more people in contact with the Cretan diet, so that they can enjoy its benefits and we promise them to always create innovative products of superior taste based on this very diet.